Some of the better universal adaptors will also cater for Switzerland as well. The electrical sockets used in Switzerland are type J. You will therefore need a UK 3 pin to type J adaptor in order to plug in your appliances. Please be aware that whilst a travel adaptor will allow you to physically plug a UK 3 pin plug into a different socket it will not change the voltage or frequency of the supply. Voltage - The mains voltage in Switzerland is 230 V which is compatible with all UK appliances (UK voltage is currently specified as 230 V +10% / - 6%). Frequency - The frequency in Switzerland is 50 Hz which is the same as the UK. Special considerations - C only in the form CEE 7/16. In some very old installations, type E sockets or sockets that are compatible with type J and type E plugs are found. You may also be interested in. . .
Interactive map - Zoom and pan to any country in the world. Please note that while we take great care to give the best advice available our recommendations may not always be the most suitable for your particular circumstances. When you travel as much as we do you come to realise that some countries just don't know how to stick to the rules! Please use our recommendations responsibly and do some extra research on the particular area that you are travelling to if necessary. This will help us to show you adaptors that will work with your domestic devices. 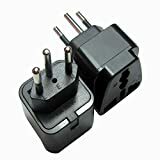 Tip: If you are not located in the UK or USA just click on the picture that shows your domestic plug or socket / outlet type and we'll know what you need. Alternatively if we do not support your specific plug / socket types yet you can close this and view the site with default settings. You can change your preference at any time by clicking on the flag icons at the top of the page.